This page started about eight months ago when I adopted my first unborn baby angel from Di's Wonderful Life Adoption Center. I did it as part of a joke page, but the joke was on me. I discovered that not only was I a closet pro-lifer, but also I adored angels. I adored adopting web angels and naming them. They were so cute. Of course I was not all that fond of Diane's graphics which are really Anne Geddes' graphics, so I often ended up making my own. I like my angels robust and I like both male and female ones, not to mention angels of color. In addition, one of my cats, Evander, is dying of leukemia, and perhaps due to that, I find the idea of angels and their presence an even greater comfort. I wanted a place on the net with my own angels. I hoped I could adopt another angel from Diane. It is a wonderful feeling to be in the company of other angel fans. Unfortunately, she has closed her adoption service. Oh well, I can create and name my own angels and experience the good feeling of angelic protection through my art. This female angel with a bow and arrow is tough and powerful. Her name is Evadne, and she is currently an angel without a cause. I guess that is sort of like a minister without portfolio. She is one of the guardians of this site. She resembles Artemis/Diana more than Cupid, but a no nonsense Diana. This little boy angel is a variation of female angels seen all over the web. He came out a bit comical but maybe that is a good thing. Angels have to bring joy, and it is said that they take many forms. His name is Laurentiy which means crowned with laurels. I found the name at Eponym which has a great international names section. This African angel girl, Aiyetoro, is dedicated to all the children being murdered and brutalized in the not-so-civil war in Sierra Leone. Her name means "peace on Earth" in Yoruba. You can find lots of great African names on Namesite. If you would like a copy of her, you may take her and name her as you wish, but please dedicate her to the children of Sierra Leone. For news on the war in Sierra Leone, visit Africa.com and to learn more about Sierra Leone in the CIA World Fact Book. This angel whose name is Reina Candida is dedicated to all the teenagers in private reform schools, behavior modification programs, and prisons. You can read about these at Teenaid. You can copy this angel if you want to have something on your page about this violation of basic youth civil rights. This little sailor boy angel is dedicated to the men of the Russian submarine, Kursk, and to their grieving families. If you are willing to mention the Kursk on your web page, you may have this little sailor boy as a memorial. I've named my little sailor boy angel Kiril Yerik. 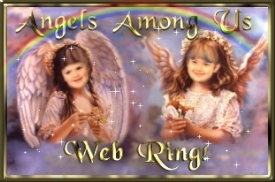 This Angels Among Us ring site is owned by Roanna. Click here if you would like to join. This Angels in My Heart ring site is owned by Roanna. Click here if you would like to join.